All eyes were on Duchess Catherine, who stepped out for a gala for one her dearest charities - the Anna Freud National Centre for Children and Families(AFNCCF). Attending dinner without Prince William, the royal looked illuminating in a black lace Diane von Furstenberg 'Zarita' dress, that highlighted her growing baby bump. The mum to Prince George and Princess Charlotte is pregnant and expecting her third child in April next year. The 35-year-old showed no sign of slowing down, greeting and chatting to the families who have benefited from the AFNCCF. Kensington Palace shared: "HRH has a continued desire to draw attention to child mental health issues." 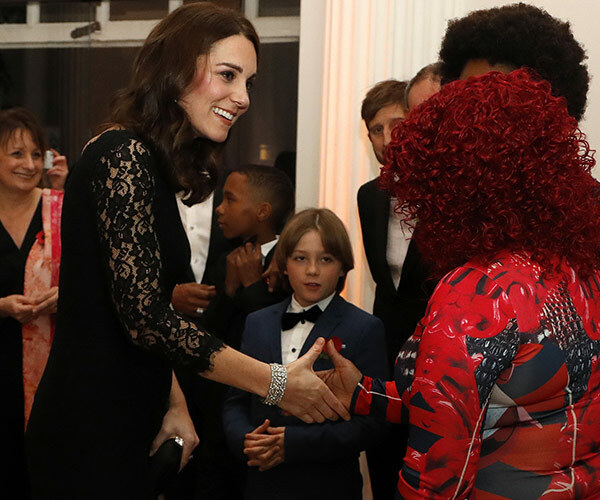 The gala, which was held at Kensington Palace, celebrated the charity's work - they aim to help those who are battling mental health challenges. As she mingled across the floor, many royal watchers remember they first saw Duchess Kate in the black frock back in December 2014, when she was pregnant with Charlotte. Catherine seemed radiant, and appears to have well and truly passed her severe morning sickness, which she suffered during the first months of her pregnancy. The soon-to-be-mum-of-three has been a long time royal patron for the Anna Freud National Centre for Children and Families. Earlier this year she dropped by their Early Years Parenting HQ, where she learned how they aid families with young kids under the age of 5. At the time, the head of the charity Peter Fonagy mused, "She knew exactly what these mums were talking about — about children not sleeping and how stressful it is to try and bring up small children." "All the mums said how much she talked to them as just another mum." The Duchess of Cambridge is hugely passionate about understanding and highlighting the issue with maternal mental health. Just last week, the 35-year-old hosted a private meeting at Kensington Palace. The pregnant mum headed up a round table discussion focusing on maternal mental health. The meeting was not formally announced, with the Palace simply sharing a snap from the discussion. "The Duchess is keen to develop an understanding of the issues surrounding maternal mental health, and to learn what support is available." William's wife met with academics and practitioners from Maternal Mental Health Alliance, Anna Freud Centre, Family Action, Royal College of Obstetricians and Gynaecologists, Kings College and Best Beginnings. The 35-year-old has always been open and honest about her experience with motherhood. While she has described it as a "rewarding and wonderful experience", Kate has admitted that there are moments that are can be a "huge challenge", where she felt a "lack of confidence".